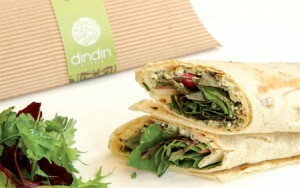 Suffering from severe menu fatigue, Nellie Nichols goes looking for something a bit different to the usual salad, wrap or sandwich options … and finds it in the shape of Dindin Kitchen, a new Persian food to go concept in Gray’s Inn Road, London. 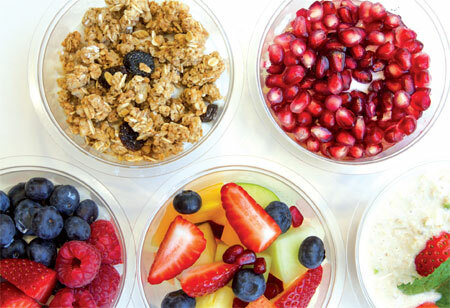 Nine times out of ten, wherever I am, the choice is the same if I want something on the go: salad, wrap or sandwich; salad, wrap or sandwich, and what goes in it tends to be as predictable as what is on the outside. The not very surprising can be bland, and often disappointing. What I endlessly crave is that lightning-bolt moment of deliciousness, causing my taste buds to dance; with flavours so well matched and running in tandem with every kind of texture from soft to crisp and back again. What’s happening out there and why is everything I come across so safe and lacklustre? Don’t get me wrong: it’s not that I don’t enjoy a BLT, a Chicken Club, a Caesar Salad or a crisp baguette – I eat enough of them from one outlet or another with alarming frequency, but still I yearn again and again for my lunchtime world to be rocked. Yes, of course I know the arguments: safe options are … well, safe .. and low waste is best, along with the rest of it, but consumers in general, not just me, do also crave excitement and something different. We all know the magnetic and magical power of the word ‘new’. But, ever the optimist, I live in constant hope that novel fledgling concepts will emerge and start to challenge the high street landscape we are now so familiar with. The risk for anyone starting from scratch is, of course, a great one: from the lottery of finding a good enough site in a prime location with the right footfall, before it is snapped up from under the nose by a successful chain, to the building and equipment kit-out costs that follow. 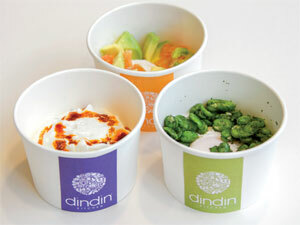 I’m not sure I would have the stomach for the sleepless nights those risks might potentially bring and I definitely wouldn’t be brave enough to give up a secure and safe career in finance in the City either, but now please let me introduce you to Vida Tayebi who has done just that with Dindin Kitchen. I meet Vida within two days of her opening what has been the fruit of three years of labour; what she describes as an innovative Persian eatery, incorporating lots of twists and turns to appeal to the western palate, age-old recipes made with perfectly sourced ingredients. She is calm, confident and lovely, the sort of person whom I would elect to have in my lifeboat. I know it’s a done to death expression but she says she saw a gap for Persian food in the market and decided to fill it. So I’m excited as soon as I sit down really; here potentially is the exotic, the new and the delicious. All around me in this white, bright interior in Gray’s Inn Road is what I can only describe as a well-organised small army of helpers loading shelves, changing the menu boards over from breakfast to lunch, and chefs firing up the grill for lunchtime service. There is a definite different feel to the place from other start ups – almost nothing appears to have been left to chance. From the production kitchen below comes tray after tray of little pots of lovingly prepared mezze of healthy sides, salads and wraps. The menu is built around a few select dishes of grills, hot flatbreads and hot boxes, which can be ordered separately or bundled cleverly together. Breakfast is a selection of hot egg pots of poached eggs with different interesting toppings from pomegranate sauce, broad bean garlic and dill, and tomato and sumac, to smoked salmon and avocado all served with Barbari Persian bread, or breakfast flatbreads ranging from goats cheese with caramelised figs and rosemary to halloumi with avocado and mange tout. This is a very different breakfast but one filled with mystery, with interest and intrigue. So I’m keen as mustard now to try some of these dishes with Vida and for her to explain why there are no references to anything being of Persian origin. Now here’s the clever bit: by explaining her dishes to her customers she is introducing a historical wealth of recipes without them being off-putting and polarising. This is Persian food, but you wouldn’t necessarily know it. Here is the introduction of fragrant, healthy deliciousness, yet nothing is heavy and over- spiced – the perfect work-day lunch. All her soups are made from scratch; one from lamb shoulder with chickpeas, lime and fresh saffron; then there is a barley with mixed beans and fresh herbs. But my favourites by a country mile are the sweet and sour pomegranate with baby Persian meatballs, and the noodle soup made with lentils, Persian noodles, parsley, spinach and coriander and subtlely flavoured with pomegranate molasses. How blissful will they be on a cold and frosty winter’s day; these are truly the tastiest soups I have ever tried. The grill is in full action now and there are skewers of chicken, lamb fillet and minced lamb sizzling away for an expectant line of customers. They can all be served with a rice of the day, fragrant fresh and fluffy; one infused with dill with broad beans, another with saffron and cumin with nuggets of barberries and the best of all: sour cherry rice which also comes with big generous Persian meatballs. If you don’t want a skewer with rice you can have a hot flatbread version wrapped tightly with fresh herbs, tomatoes, Persian bitter gherkins and sauce. Now I am trying a hot chicken wrap: the chicken freshly grilled has been marinated in yoghurt lime and saffron. It’s delicious, make no mistake, with a zingy freshness to it, but with a slightly hefty price tag too of £6.45. But the star of the show and something I have never come across in all my days is the surprise in the hot box, accompanied by a little dipping pot of cucumber raisin and mint yoghurt. Here is Vida’s mother’s special secret recipe of a chicken and lemon saffron soufflé. Two big squares of the lightest most glorious soufflé I have ever eaten, made up of thousands of tiny flecks of the moistest most tender chicken mixed with herbs and saffron. This I could eat every day for a week and then some. Vida is keen to know what I really think of it all and honestly I am fairly bowled over by what I’ve seen and tasted. Yes, there could be more photographs of the many fresh and exotic ingredients that go into the many cold wraps on the menu board to compound and illustrate freshness; there could be far fewer drinks, replaced by more mezze pots in more sizes to join the delicious aubergines and lentils, and how about lovely takeaway options for suppers and picnics to pick up on the way home? But when all is said and done, this in my opinion is a real show stopper of a new concept and one which when it takes off, and take off it will, I almost guarantee, should be destined to become a household name, along with the best of them. 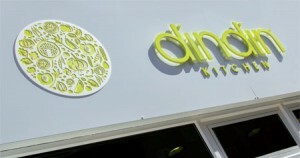 I for one would like to see many more Dindin Kitchens opening all over London on many a high street. Bring on the pomegranates.